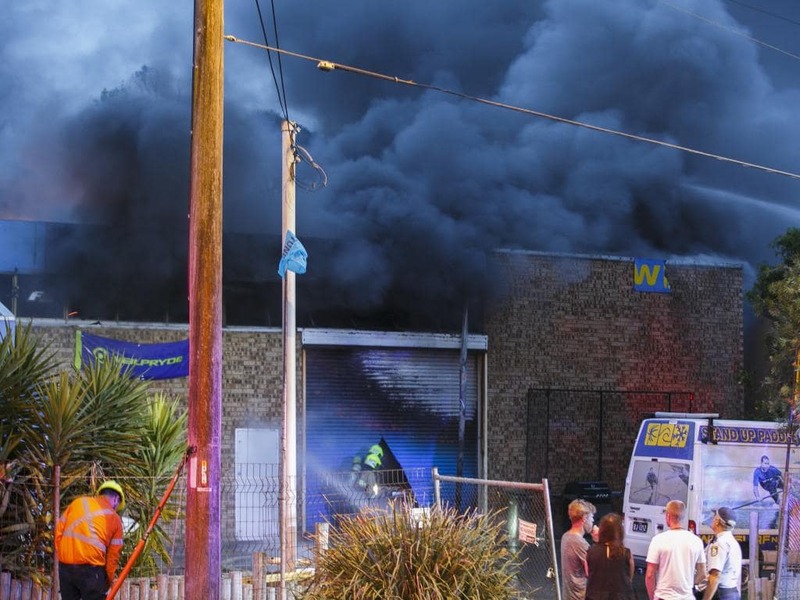 A fire started at a board shop at Collaroy shortly after closing time last night. At about 8pm, emergency services were called to the Wind Surf N Snow factory on Anzac Avenue, Collaroy. The factory is located just off Pittwater Road. An estimated 100 residents from nearby houses, units, and businesses were evacuated as a precaution while officers fought the fire. It was extinguished by 10:45pm. No one was injured. Wind Surf N Snow doesn't manufacture equipment on site, they primarily import equipment such as kiteboards, SUPs, and more recently foil boards. The estimated bill for lost stock is $250,000. Officers from Northern Beaches Police Area Command established a crime scene and commenced inquiries. They also don't sell any snow gear at all either. Mostly a warehouse SUPs and Foils. Assume all the black smoke was from burning foam and fibreglass ? Always wondered what that shop was selling - drove past thousand of times but never had the urge to pop in. Come to think of it, there's a lot of surf shops on the Northern Beaches that fit that description. I always assumed they were owner-occupier, as the rents are so exorbitant these days. Oh no instant SUP shortage on the NB. Sadly a quick google search says otherwise unfortunately. Hopefully the whole SUP thing is close to peak and will drop away. Remember when sailboarding was massive only to give way to kiting. Foiling is on the way up. Goat boating seems to have gone to curry. Knee boarders are so few and far between i quite like seeing them out now. Boogers mostly between the flags. Fin-less and soft tops on the march ? Yep soft boards are the next craze. That's really sad. Sam is a great bloke with a young family. Regardless of our thoughts towards Sups I'm sure we can all wish him the best for the future. I know I do. Fair point. Hope he has good insurance and is not out of business for too long. Craig I've noticed a resurgence of sluggos playing said game. That your style ? Seems to be growing in popularity (the game and sluggos). I just get a glance as i hop off the ferry. What are the rules. Are there rules ? Yeah it's actually really really fun and the workout is insane. I've noticed making more of those critical reos in the surf from the increased core strength. Rules, haha basically there are none. You can tackle, push, jump onto and push people off their boards with your own weight or paddle. Even when not near the ball or at the other end of the court, though that's pretty brutal. Two orange buoys at either end which are the goals, five a side and like netball once you pick up the ball you can't keep paddling. You can drift but try and pass it to a team mate and hit the buoy with the ball. Then everyone has to race back to get back onside as the other team attacks. That repetitive back and forth and trying to stay on the board when people are trying to take you out is what keeps you fit. Post game/training beers at the wharf are a bonus as well. My first year but it is getting more popular for sure, had mates play for a few years. Next minute SUP quidditch will be an Olympic sport. You play Supball? In a team? Do you meet afterwards for drinks? Yep and yep, see above. Wind Surf n Snow are a core local small business, who cater to the windsurfing, kiting and sup community. Sam the owner is a lovely bloke, family man with young kids to support. He is an accomplished paddleboarder, competes regularly in the molokai paddleboard race and still finishes in the top echelon despite being well into middle age. Always happy to chat to anyone who comes in, no pretence like some of the 'surf shops' you go into. News of this is really a terrible shame, I really hope that the insurers look after him.